Both nationally and internationally, Ton van der Veer has worked with many manufacturing, wholesale and export companies to help them make a stand-out first impression with their product or service. This may be at a busy trade event where you have a limited time and space to make a big impact, in your showroom courting potential customers, or for catalogue photoshoots where you want your product presented in a surprising new way to get the attention of your target customer. 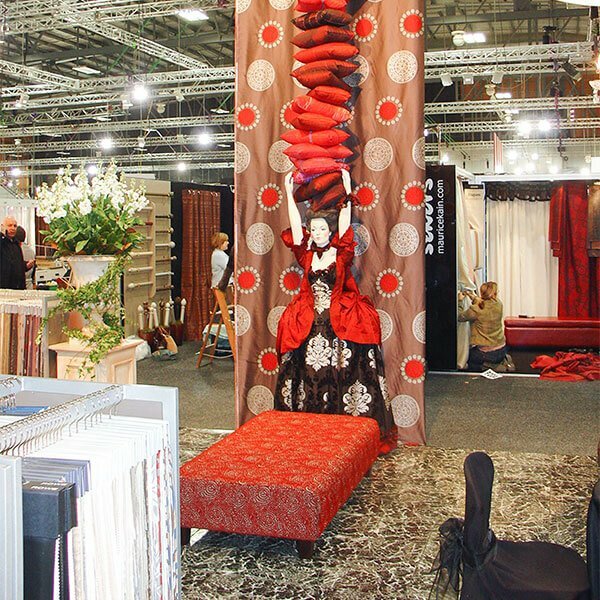 Internationally-renowned textiles company Charles Parsons commissioned Ton to design a stand-out trade exhibition stand for a large expo. Ton produced the overall conceptual space to include backdrops, hanging draperies and flooring. To showcase the fabrics, he settled on a Marie Antoinette theme and had magnificent period dresses made, as well as mannequins balancing various cushions on their heads. Ton van der Veer Limited designed, costed, manufactured, project managed and implemented the finished stand. Ton’s unique ability to create a ‘wow-factor’ experience resulted in a polished result – the stand won Best Stand of the expo.